Another early start in Hawaii as my body decided 4:30am is the perfect time to wake. At least I could slowly come round and get ready for the day’s training. After an easy beginning to the week there was work to be done starting with another easy run at first light. 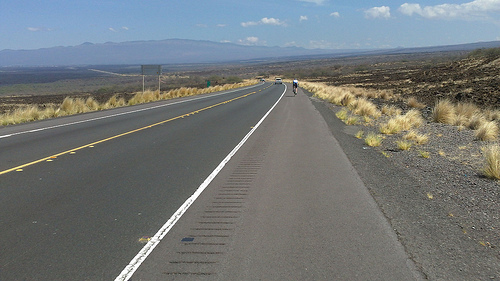 I took side roads out to the Queen K and ran the final rise to the top of Palani. It’s the point I tried to break away from my running companion last year. I surged at the base of the hill soon realising my mistake as the ‘small‘ hump was much longer than expected. By the top I’d worn myself out and was promptly dropped. I took it easy today enjoying the fact I can run again even if it’s not as fast. No surges and a mental note that if I’m fortunate enough to be in that position this year I wait till the top! You never know it might gain me a place! One workout in the diary it was straight to the pier for the morning swim. The tide was high and compared to the day before the water seemed calm. Beyond the pier it proved to be an illusion as the sea was lumpy, but I felt good and pushed on out heading for the turn point. Once I’d past the last safety kayaker and had nothing to sight off I paused and floated. It’s a beautiful place to swim, but when you’re all that way out on your own and can’t see the final buoy it’s lonely. I decided to turn and head back for company doing laps further in was as valuable as swimming the course. Despite rough water I enjoyed the swim immensely feeling strong and comfortable in the water. Two workouts in the diary I met with Tim, Laura and their respective partners for breakfast at Lava Java. I’d spotted the Pancakes yesterday and decided they were going to provide the carbs to fuel the day’s ride. I’ll assure you they didn’t disappoint and I was stuffed! There wasn’t time for a leisurely breakfast as we were all keen to get on with the ride. Things didn’t start well as Laura suffered first one puncture followed by a double puncture five minutes down the road. Out of spare tubes with suitable length valves she had no option, but to bail and call her husband Andrew for a pick-up. Tim and I headed on for the turn at Kawaihae generally keeping the pace easy and enjoying the benefits of a tailwind. A quick Diet Pepsi at a service station and then it was back home. We both aimed to ride at race pace meaning it wasn’t long before Tim vanished up the road. I was working hard, but he was really going strongly. The pleasant tailwind was now a relentless headwind that slowly ground away at us. With 55km to get back to Kailua-Kona it became the perfect race simulation. I worked to keep power up, but found myself experiencing low patches and struggling. Probably residual jetlag and the lack of acclimatisation. I pushed through and made it back to town with a solid ride (details on Garmin Connect) and workout three in the diary. I rode past my hotel and straight to Lava Java for the second group get together there. Over a more leisurely lunch I was pleased to learn that Tim had been suffering too and he’d been going over his race wattage early on! My legs felt shattered. Reminiscent of those hot, dehydrating turbo sets the RPE for this ride far outweighed the actual intensity. Conditions here are unforgiving and it pays to pace wisely on the course. Proper acclimatisation should take the edge off it. Whilst it was a tough day and my legs ache I certainly didn’t suffer in the way I recall last year. It was satisfying to see the power data represented a significant step up over last year too. I may have felt RPE was off (and cursed that the battery has died in my HRM Chest Strap), but it was still better than in 2009. All I need is for this to carry through till race day. My recent metabolic testing has given me data to use in the Ironman. I’ve a clearer picture of the amount of carbohydrate I’ll use at race pace. That single piece of knowledge helps contribute to judging the fuelling strategy required. Starting with an assumption my muscles are full of glycogen on race morning and estimating the amount of CHO required for the swim (if anyone has ‘typical’ figures for CHO usage during swimming I’d be interested) gives me an idea of how much remains in the system when I leave T1. The objective of eating during the race is to help spare limited glycogen reserves. Knowing the rate of CHO usage at a given intensity and the maximum rate you can potentially absorb allows you to double check your ability to fuel your race. Ultimately you want to arrive at T2 with reserves still left. If my target wattage is 230W based on my tests I’m be burning carbs at around 2g CHO/min. If the fructose/glucose combination allows me to potentially absorb 1.9g CHO/min then I can save a lot of muscle glycogen. I suspect 1.9g is optimistic so estimated off 1.5g about 90g CHO/hour. Conveniently Powerbar gels contain 27g of carbohydrates in a fructose/glucose mix. Three per hour equates to 81g CHO close to my target intake. Making a final assumption that 230W would take me under last year’s ride time of 5:16 and you can estimate I’ll need 16 gels to get me through. 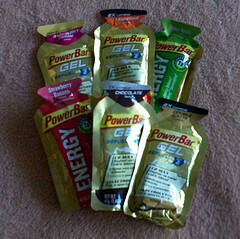 As part of today’s ride I sampled gels to see which was most palatable. Current winners are Raspberry Cream and Strawberry Banana though I’m not 100% certain which will fill my gel bottle. Whilst the hint of caffeine in Strawberry Banana doesn’t harm the taste I’m not sure I want it in bulk quantities. I suspect like last year a couple of chocolate gels will go in the back pocket as a pick me up. I’ll admit these rough calculations don’t change my previous strategy much. They do confirm it and give me more confidence I can race at this wattage. What I’ll focus on is keeping my intake of gels evenly spread over the course of the race. Swigs of gel every 20 minutes should do the job perfectly. I’ve a couple more rides to test this out.